Growing up in suburban Detroit, I was raised on a steady diet of Looney Tunes and Merrie Melodies featuring Bugs Bunny, Daffy Duck, and Porky Pig. However, the package of cartoon shorts syndicated to WKBD-TV, Channel 50 in Detroit consisted mainly of middle-period "Golden Age" Warner Bros. cartoons from the 1950s. More or less these were the same cartoons that also turned up on "The Bugs Bunny/Road Runner Hour" (among other titles), airing on CBS Saturday mornings. The most famous Warner cartoons, shorts like What's Opera, Doc?, One Froggy Evening, Duck Amuck, etc. were part of these packages. So popular were these that around the late 1970s another package of syndicated Warner Bros. cartoon shorts turned up, these from the earlier "Golden Age" era of roughly 1944-1948, but this package wasn't around very long, at least not in the Detroit market. Also, CBS for a time began airing later (and lesser) "Golden Age" cartoons from the early to mid-‘60s, but gradually reverted back to the tried-and-true classics most of us have seen dozens and dozens of times. Then something quite strange happened. Some 79 early black-and-white cartoons dating from 1935-43 began turning up, inexplicably in color. Done on the cheap, Warner Bros. had these shorts redrawn primarily in South Korea, via a process that apparently involved retracing the original animation cels, or copies or projections taken from prints. The work was comically shoddy and inept, and the shorts looked awful. Since the advent of home video, Warner Bros. has released and rereleased the classic shorts from the 1950s many of us can quote line for line, but with Porky Pig, aka "Porky Pig 101," Warner Archive is trying something different, something that fans of these shorts will hopefully embrace and thus prompt more releases like it. This 5-disc set encompasses every Porky Pig cartoon from his debut in 1935's I Haven't Got a Hat through 1943's Porky's Pig Feat, every black-and-white Porky cartoon, presented chronologically, some 101 in all. What's so great about this is that while the shorts are hit-and-miss, viewers can trace the step-by-step development of a Warner Bros. cartoon character, and more broadly the gradual ascent of "Termite Terrace," their in-house animation studio. 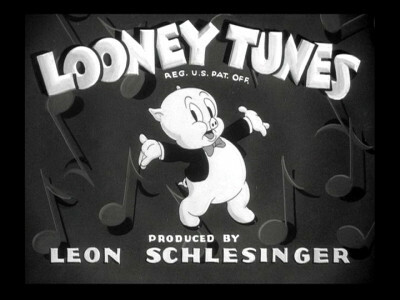 Porky Pig was Warner's Mickey Mouse in the sense that he was the studio's first big cartoon star, but his career trajectory didn't much resemble Disney's character, at least at first. Mickey was seen as a star protagonist from the beginning (to replace Walt's Oswald the Lucky Rabbit, when in 1928 Disney lost the rights to that character). Rather, like Donald Duck, Porky began as a throwaway supporting character with a funny voice that audiences took to. Unlike Donald, whose screen persona quickly set into the irascible, excitable duck forever battling Chip & Dale, his nephews, insomnia, inclimate weather or anything else one can think of, Porky's early films were wildly inconsistent. This was a problem with the studio that never really went away, as if the animation unit forever lacked a single guiding hand for its characters. Even during the classic postwar shorts, Bugs Bunny (for example) behaves and is drawn and animated in subtly different ways depending upon who's directing him. In the early Porky Pigs he looks very different from one short to the next, and his character changes markedly from cartoon to cartoon, even as he became Warner's biggest hand-drawn draw. Similarly, watching these early shorts, I was struck by the crudity of the animation, which resembles Disney's early talkie cartoons (which rapidly improved and peaked with their Technicolor work in the mid- to late-1930s). Whereas Max and Dave Fleischer's black-and-white cartoons for Paramount were gorgeous by 1935, Warner's remained pretty crude, and until well after the war. Bob Clampett was the first director to make his mark with the character, most famously in Porky in Wackyland (1938), but that short was made about a year after the introduction (in Tex Avery's Porky's Duck Hunt) of Daffy, who'd soon eclipse Porky in popularity (only to be eclipsed himself by Bugs Bunny soon after - and likewise introduced in a Porky Pig short). Like Mickey Mouse, Porky Pig was too wholesome and innocent (though more irritable) to succeed as a "leading ham," loveable as he is. But where Disney would team Mickey with Donald Duck and Goofy in a number of superb short cartoons, Porky ignominiously became a star of cartoons he was barely in, such as Who's Who in the Zoo, a series of blackout animal gags, with Porky making little more than a cameo appearance as a zookeeper. He starred in 16 shorts in 1938 (plus one Daffy Duck short); by 1942, Porky starred in just three. Shorts made after the scope of this DVD set, such as Scaredy Cat (1948) and especially Drip-Along Daffy (1951) would be hilarious use of Porky as, respectively, a funny straight man and loyal sidekick. The shorts included here are priceless as historical artifacts and of invaluable interest to animation buffs, but a lot of them are routine or mediocre; scattershot, with true classics popping up intermittently, for no obvious rhyme or reason. In past home video releases of its classic cartoons, Warner Home Video has uncomfortably leaned more in the direction of the mainstream market, i.e., cartoon sets parents can switch on and keep their toddlers occupied for a couple of hours, rather than for hard-core animation enthusiasts. Porky Pig is more clearly marketed toward the latter. All but two of the shorts are in black-and-white, and while Warner's unskippable disclaimer condemning the shorts' political incorrectness, an annoyance on their earlier Blu-ray sets as well, remains, the cartoons themselves are uncut and uncensored. Some look better than others, but they're all there, in one set, and none of those I've watched so far looked as terrible as some of the video transfers that turned up as extra features on some of Warner's early DVDs of live-action features. The Dolby mono audio is good and the set I received has five pressed DVDs, not DVD-Rs. Warner Archive increases the desirability factor exponentially by loading each disc with supplements. There are 15 audio commentaries, by such animation experts as Jerry Beck and director Joe Dante, plus there are shorts with embedded storyboards and "Porky's Breakdowns of 1939," a brief but, if you've never seen it, startling clip. Of vast interest and importance to anyone seriously interested in classic animation, Porky Pig is a must and a DVD Collector Series title.